Seville is one of Spain's most enchanting cities. And the best time to experience its magic is during its famous April Fair. To get the most out of your visit, here's our guide to everything you need to know about La Feria de Abril. Originally a commercial fair for farmers when it started back in 1846, the Feria de Abril (also known as Feria de Sevilla) has grown into one of Spain's biggest spectaculars. Kicking off two weeks after the city's elaborate Holy Week celebrations, the Feria is a celebration of all things Andalusian: music, food, sevillanas dancing and more! Due to the timing of Easter this year, the 2019 Feria de Abril will actually take place in May, running from 4th May to 11th May. The celebrations take place in Feria de Abril fairground to the south-west of the city centre, with nearby Los Remedios a good option for those looking to stay close to the action. Lively Triana is another excellent area to stay, while the twisting streets of the Santa Cruz neighbourhood around the city's elegant gothic cathedral make it popular with visitors. The fairground has over a thousand brightly-coloured casetas (small marquees) everywhere you look. These casetas, hosted by all manner of local organisations, are the life and soul of the Feria, with most equipped with a kitchen, bar and tables to serve up delicious food and drink all day long. 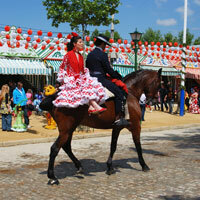 Men on horseback roam the fairground, while locals in traditional dress dance sevillanas, a popular local dance. Eating and drinking is at the heart of the Feria celebrations, so it should come as no surprise there are plenty of great bites to be had. Whether you choose pescaito (fried fish), montaditos (small sandwiches) or churros con chocolate, there's something for everyone. And to wash it all down, try a local Cruzcampo beer or a rebujito, a popular cocktail of sherry mixed with soft drinks. While festivities may be centred around the Feria de Abril, don't forget to check out the rest of this charming city. Climb the cathedral's imposing La Giralda bell tower, explore the iconic Las Setas de Sevilla wooden sculpture and enjoy some of Spain's very best tapas bars. If you're travelling to Seville, it's essential you get the right cover for you and your plans. At World First, we offer dedicated travel insurance cover for families that'll give you peace of mind when enjoying the Feria de Abril celebrations.